I read this article and found it very interesting, thought it might be something for you. 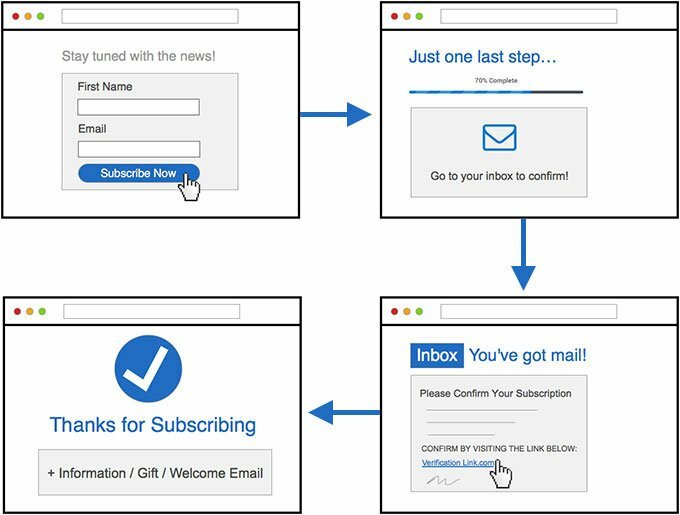 The article is called Onboarding Process: Turn your Visitors into “Active” Email Subscribers and is located at https://howtogetref.com/build-email-list-scratch/. This expression depicts the relationship between substantial email lists and long term results (e.g. making money online). Even though my blog has been online since years, it’s just as of late that I began gathering the perfect tools to build an email list. And I must admit that it’s really powerful! 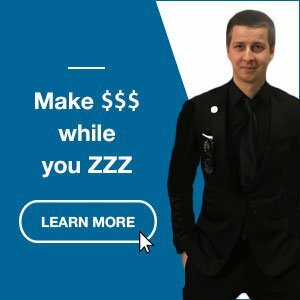 I will go even further by saying that if you manage to grow your email list to a decent size, you could virtually be able to generate an income on-demand. Indeed, if there’s no money coming, you could reboot immediately your cash flow by sharing a promotion, by launching a new service or by broadcasting valuable resources on which you enjoy affiliate commissions. How to build a responsive email list? Without a reliable source of leads, your business growth is hard to predict. You’re never quite sure where your next customer is coming from; you’re grateful when they show up and at a loss when they don’t. This is can be achieved through blog, guides and beautifully-designed marketing websites. There are numerous lead generation ideas that are proven to work. I’m sure you could implement a few of those right now on your websites and enjoy a spike in results! The online marketers love to apply the KISS principle (“Keep it simple, Stupid”). And I’m guessing it’s the reason why a bunch of those are building their email lists using single opt-in. 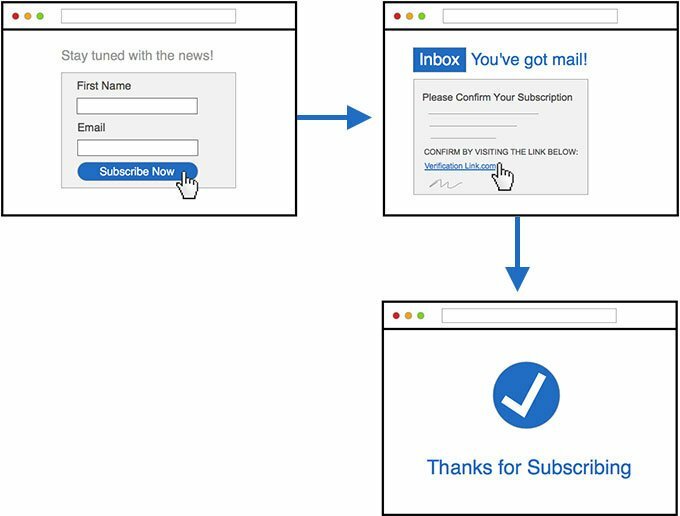 With single opt-in, new subscribers fill out a signup form and are immediately added to a mailing list. The process is simple, but there are huge drawbacks: the leads quality, bounce rate, and spam complaints, just to name a few. The Confirmed Opt-In is used to prevent spam and ensure that only people who specifically request your information are subscribed to your list. In step one, a visitor sees your Call-To-Action (e.g. “Subscribe Now”) and decide to fill out your online signup form to become a “Subscriber”. In step two, they’ll click a Confirmation Link in a follow-up email to be added to your Email List. Why Should You Use Confirmed Opt-In? Protection against spambots, email scams, and fake subscribers — which could increase your monthly billing rates. Assurance of valid email addresses, confirmation that your subscribers want to hear from you, and an archived record of the subscriber’s consent — which protects you from false spam complaints and possible account closure. As an ISP standard for managing mailing lists, it ensures the best possible deliverability for your messages — higher campaign open rates, and lower bounce and unsubscribe rates. As you can see, double opt-in is the way to go — unless you wish to waste your money and put your business at risk. How to Enable Confirmed Opt-In? If you are already using an email responder service, head for their knowledge base, FAQ or support to find step-by-step instructions. I’m personally using (and recommending) the #1 email autoresponder software: Aweber. They have proved over years to have and maintain the best email deliverability rate from the market (Sender Score: 99%+). 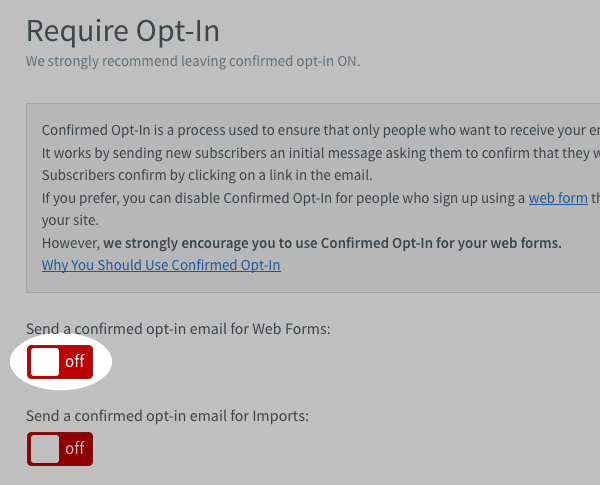 “Confirmed Opt-In” is automatically enabled for all subscribers added to your AWeber account. 1. Choose the list you want to work with from the “Current List” drop-down menu in the top center of the page. 3. From the left hand side of this page, click “Confirmed Opt-In” on the right. and click “Yes” on the popup that appears. – you don’t have to do anything else. While you are on that page, take the opportunity to customize your confirmation message. Make sure the email makes it clear what a new subscriber is opting in to. This can help convince recipients to take the extra step of confirming the subscription, and also builds trust by telling them what to expect. Once you enabled confirmed opt-in, the quality of your list will be improved. But things are far from being perfect! A major issue with such “default template” is that a lot of people may decide to subscribe and submit their data but they are not aware that they need to seek for an email in their inbox to validate the request. And by the time they check their inbox, they may have forgotten about you. Your verification email could also get flagged as “spam” or be lost due to the large volume they deal with. Let me show you a quick yet powerful method to improve your confirmation ratio and build an “Active” Email Subscribers List. Your visitors may only see your website once. Do not waste your luck! If your content or call-to-action convinced them to subscribe and stay in touch, you want their experience to be outstanding. The signup form is the first experience your potential subscribers will have. They’ll fill out the form and confirm to subscribe to your email list. Once the visitor submitted his data, he will be redirected to a “Thank You” page. This page tells your subscriber to check their email for a confirmation message. You can use a default page (assuming your autoresponder provide one), but if you wish to optimize your conversions it’s better to redirect to a custom signup thank you page on your website. The confirmation email contains a unique URL that your subscriber must click to be added to your list. Customize the text and design of the email to match your organization’s branding and style. When your new subscriber clicks the link in the confirmation email, this page will open in a new window to let them know they’ve successfully joined your list. This optional email is disabled by default, but you can enable a welcome email at any time. This email is sent after a subscriber confirms their subscription. Some people use this message to send their new subscribers a welcome message, or coupons or promo codes. In order to avoid wasting a substantial amount of money (hiring designers and coders) or time (going through the hassle by yourself), I recommend you to use LeadPages. LeadPages is a cost-effective “drag & drop” tool which allows you to create call-to-action, funnels, landing pages and integrate it easily with all email autoresponders. We will be using it to create custom “Thank You” and “Welcome” pages and integrate it in a few clicks into a (WordPress) website and with your favorite autoresponder (Aweber). Click this link to open LeadPages on a new tab, then click on the blue button “Get LeadPages” and choose your favorite plan. “Standard Plan” could be enough for personal usage and it’s really cheap (as low as $17/month if you apply for a 2-year billing!). “Pro Plan” comes with extra features detailed on the pricing page – this is the plan you will need if you want to access their Affiliate Program (30% recurring commissions on sales – long story short, if you recommend it to 4+ people you are actually paid more than what your membership costs!). Note: all the plans come with a 30-day money-back guarantee. This being said if you are low on budget or unsure you want to commit, you can go to “Templates” tab and purchase one that you love (starting at $1). This small “trick” allows you to receive a 30 days membership trial to test everything and take your final decision. A visitor who has just accepted an offer from you is incredibly valuable – suddenly you have a qualified lead on your hands that, with some appropriate guidance, could become a devoted fan, maybe even a lifetime customer. Don’t let this opportunity go to waste – instead, use your “Thank You” page to make sure the user will continue to interact with your brand. In order to get the highest rate of confirmation, your thank you page needs to make it very clear to subscribers that they need to open the message and click on the link. Join LeadPages to Duplicate this “Thank You” page (or create your own)! If you have a graphics editor on your computer (e.g. Photoshop or GIMP), take a screenshot of your inbox highlighting your confirmation message to provide the most visual example of how the message looks from your subscribers’ shoes. Integrate a “Open in Gmail” button to your “Thank You” page that links to a Gmail search for our confirmation email. This way the user can find the right the email with one click, quickly confirm, and complete the verification process. Not only does this approach make it easier for your subscribers to go through the process of confirming their email address, but it also prevents them from opening their email inbox and getting distracted by other emails and instead keeps them focused on your newsletter. They are willing to receive messages from you. Make sure it happens! You can suggest them to add you to their allowed senders list or address book (different email services use different methods). Once the visitor confirmed his subscription, it’s time to redirect him to a “Welcome Page”. Thank the person for their confirmation. Welcome them to your newsletter, and announce that they will be shortly receiving an email from you. If you’re giving away something like an eBook, for example, you can let them know that links to their gift will be included in the next email. You can ask your new subscriber to “white list” your email address so it will not be blocked by spam filters. You can provide a way to easily contact you in case they have any issues regarding your newsletter. This is also a great opportunity to add in an offer for either a product that you already have for sale, or an affiliate product related to your niche. To keep consistency, you will probably use a very similar design. It will be quick and easy to create the page with the “drag and drop” builder from LeadPages. Take your “Thank You” page, hit “Duplicate“, apply your minor edits and boom… ready to publish! Join LeadPages to Duplicate this “Welcome” page (or create your own)! 4. Finally, scroll to the bottom of the page to the “Success Page” section. By default, if the “Confirmation Success Page URL” is left blank then subscribers are sent to the standard confirmation success page when they confirm into your mailing list. To send the subscribers to a custom success page, enter the URL of the page you want subscribers to be sent to when they confirm in the “Confirmation Success Page URL” field. Be sure to include the full URL, including the http:// part of the address. Once you’re done, just click the “Save List Settings” button. There you go! Now, your onboarding process is ready to make a killing! I updated my blog using this exact system a few months back and the results have been mind-blowing. My conversions into “active” subscribers and my newsletter open-rate improved drastically. And I’m getting also more people replying to my first emails or sending feedbacks. Let me know in the comments below if that helped. If you have some extra tips or feedback on that topic, I will love to read it too! Hello, I am new here, guide please how to start.. I want to referrals on my sites, what is the first step i have to do?